A terrific report on WBEZ this morning tries to figure out exactly how many juvenile arrests take place at CPS. Check out the chart below. 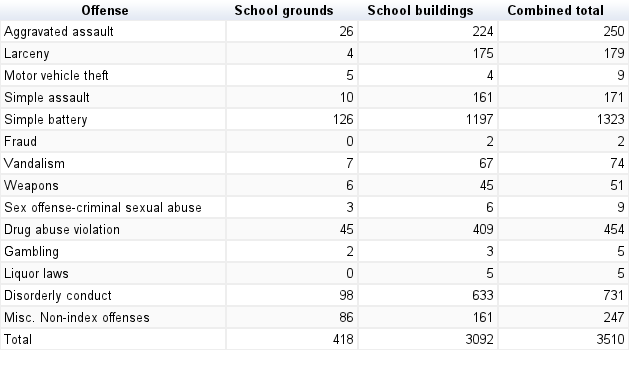 It shows all misdemeanor arrests at public school locations in 2011 for young people 17 and under. 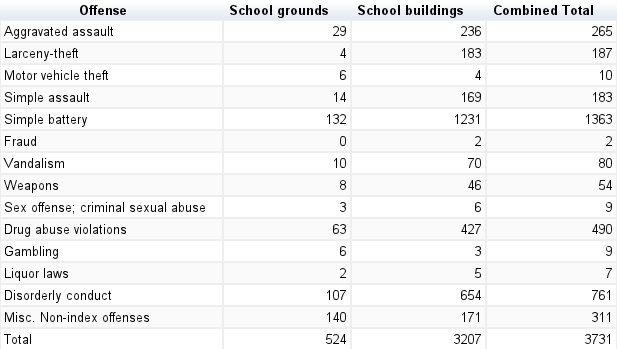 Could be any day of the week, any time of day, and you see there were a total of 3,731 misdemeanor arrests at public school locations in 2011. Now look at the following chart below, with misdemeanor arrests at public school locations only during school hours. A total of 3,510 arrests. More than 90 percent of misdemeanor arrests at public school locations in 2011 took place on school days and during school hours. School hours are defined in this data as between 8 a.m. and 3 p.m. on Monday through Friday. This entry was posted on February 4, 2013 at 12:24 pm and is filed under Chicago Public Schools, Facts and Statistics. You can subscribe via RSS 2.0 feed to this post's comments. You can comment below, or link to this permanent URL from your own site.